For those not familiar with the abbreviation CLIL, it simply means content and language integrated learning, it’s my particular branch on education. I teach my art lessons in English to Dutch children learning my (and other subjects) in their second language. Thus in my lessons they are learning about art and creativity and simultaneously learning English. My daily challenge is how to work the language element into the content. I want to share an example that I’ll be making use of today. For non-CLIL teachers there’s no reason why you shouldn’t use the same a approach, but obviously simply in your usual language of teaching. With my first year groups (12-13 year olds) I like to mix a little art history into the practical activities and today I’ll be talking to them about Leonardo. We’ll look at the Mona Lisa and the Last Supper, but we will also be spending rather more time on Leonardo ‘the inventor’. The pure creativity of that area of his work always seems to catch the attention of the first years. I have a really nice film about modern day designers trying to build a number of the plans he drew out in his notebooks back in the Renaissance. Most of this content will be provided by the film itself, although I’ll undoubtedly be expanding on it during discussions. That sounds like quite a list of targets and quite a complex learning situation but it is actually quite simple, and it is a lesson strategy that will work regardless of whether you are a CLIL teacher or one involved in regular education. Begin with an introduction to the work of Leonardo, show a few examples of paintings, discuss with the class what they already know about him. Encouraging pupils to share verbally and maybe building a word web on the board. 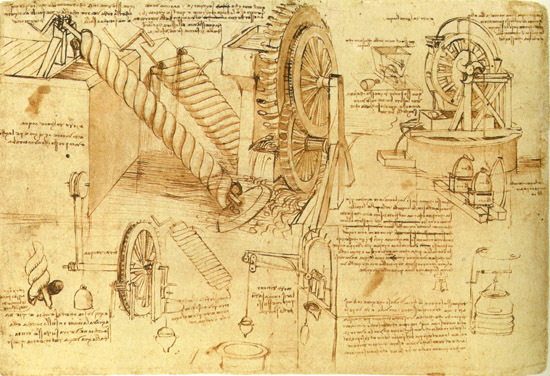 Lead onto the fact that Leonardo was also an inventor and designer. Explain that we are going to watch a film about the inventions and designers trying to remake some of his plans. Draw attention to the fact that after the film they will be doing a short presentation about the film (always good for the concentration on the film!). Watch the film, (occasionally stopping and discussing what we are seeing and explaining any particularly difficult words). Now the more intense language/CLIL part. Divide the class into groups of four. Give each group for special words that are connected with the film e.g. intelligent, anatomy, imagination, underwater. Explain that overall the presentation should be a verbal summary of the film and that each person should play a roughly equal part in the presentation. Explain that each person should take one of the words and use it in exactly the same form in their part of the presentation. The presentations must be between two and three minutes long, not more and not less. Allow the group fifteen minutes to prepare their presentation and practice it once. Presentations are given to the whole class. Marking criteria, marks are awarded for clear and good use of English, visually engaging the audience in the way you present and explain, correct use of the ‘special’ word. Bonus marks are given for fitting the presentation within the two to three minute margin. It is a very simply strategy based around a film that I wanted to show the class for its interesting content. By using this approach the pupils have focussed on the content and simultaneously exercised their listening skills, speaking skills, focussed on a little grammar in using the ‘special’ word correctly and worked as a group in planning the presentation. With a class of 28 pupils I have seven short presentations that take maybe thirty minutes to do and can be graded on the spot. Allowing the preparation and presentations to easily fit into one lesson. The first time I tried this I was shocked by the excellent quality of the presentation, above all for the ease with which the pupils were able to just talk about their little bit of the theme. It would seem that a lot of the terror that often goes with a presentation had been avoided, they dared to just stand up and talk…..which was of course the point of it all! For older classes who are more able with their use of language you can give a more challenging ‘special’ word. Choose words that actually have little or nothing to do with the film and ask them to try and conceal the words in their presentation. Not by saying them unclearly, but by trying to hide them in amongst all the points they are trying to make in such a way that the others in the class are unaware of them being used. At the end of the presentation let the audience try and guess the smuggled word.